What generator size do I need? The very fact that you’re asking the question means you’re off to a good start! Generators vary in size from 1800-watt units all the way to whole-house generators capable of producing 20,000 watts or more. The prices vary widely as well and it can be a challenge to get what you need without spending more than you need to. For the sake of the argument, let’s assume we’re talking portable generators here. After all, we’re a tool website dedicated to construction. But what’s good for the jobsite is also good for emergency power, so let’s take a closer look at the question of what size generator to buy. In general, generators fall into several different classes that can help you narrow things down somewhat. There are generators at wattage levels between these – it’s just a good place to start. Quick Tip: Generators have a starting watts rating and running watts ratings. Some brands promote starting watts, others running. Running watts tells you what the generator can consistently deliver. Starting watts are only available for a brief time. The 2000-watt generator class is where you’ll find the best prices and smallest units. Most are gas, but a few battery-powered ones that can recharge via solar panel exist. These are best for tailgating and camping. For emergency power, you’re limited to lights, fans, and the refrigerator or other small appliances. On the jobsite, some of your 15-amp tools might not be able to run. Moving into the 5000-watt generator class gets you the power level you’re most likely to find on a jobsite. 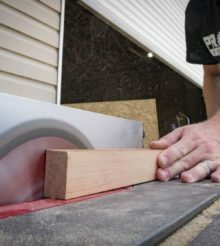 It’s good for running multiple power tools, including 15-amp table saws and miter saws. On the emergency power side, you can keep the refrigerator running along with lights, fans, or even a window AC unit. If you have your own water pump, this is the smallest you’ll want to consider – just make sure you get one with a 240V plug. At the 7000-watt generator class, you begin to lose some portability. You’ll still be able to roll it around, but you’re looking at more than 200 pounds in many cases. Those extra 2000 watts give you the ability to pretty much run an entire jobsite that’s without power. You can run lights and fans along with multiple power tools at the same time. You’ll typically find a 240V plug on these as standard equipment. The 10,000-watt generator class is pretty much the end of the portable generator sector. If you have the muscle to move it around, you can power a larger residential jobsite or even small home. There’s a temptation to wire this size unit directly into your breaker. Just be sure a qualified electrician is doing the work. The consequences of wiring it incorrectly can be disastrous. To concretely answer the question “What generator size do I need?”, you need to look at your specific situation. And as you know, everyone’s is at least a little different. For the construction Pro, let’s take a look at what you need to run. The process is easy – just take the watts you need to run everything at once and include the starting watts of the biggest power drawing tool. Let’s say you have a miter saw, table saw, and circular saw along with a battery charger for your cordless tools. Running all your tools at once requires 5,730 watts. But your table saw has the greatest startup needs at 3500 watts. Accounting for that, you need to increase your need by 1700 watts to 7430 – you need to get a generator that’s at least 7500 watts. If you and your crew are conscientious about only using one tool at a time, you can drop down to a 4000-watt unit. As you can see, the need rises quickly, so it’s always important to ask, “What do I really need to run?” Using less generator power is one of the reasons cordless tools are so attractive. Consider this – we have legitimate options for cordless miter saws and circular saws. Your generator needs could drop somewhere around 4000 watts by upgrading and still keep your whole jobsite humming. You can use the same formula to decide what size generator to buy for emergency power situations. Just keep in mind the difference between need and want! Kenny, thanks for also digging into mobile battery power supplies. Watch out for the instagrid mobile power supply. Based on Li-Ion technology, it is portable with one hand and is able to also run your high demanding power tools, water pumps etc.